THE HINDU: When Prime Minister Manmohan Singh visits Russia next month for the annual summit with Russia’s President Vladimir Putin he will be asked to wade into the long-running stand-off between Moscow’s Krishna community and local authorities over the fate of the city’s only Krishna temple which is faced with a second eviction over the past decade. “We are preparing a letter to our Prime Minister asking him for help in the temple controversy,” said Sadhu Priya Das of the International Society for Krishna Consciousness (ISKCON), Moscow. Moscow ISKCON has also appealed to Mr Putin and hope for his positive response, he told The Hindu. Bailiffs have warned ISKCON that the city’s only Krishna temple on Leningradsky Prospect may be forcefully evicted any time now that it missed the July 31 deadline for vacating the land. The Krishna community’s ordeal began in 2004 when its temple on Begovaya Street was demolished to make way for high-rise construction under an urban development plan. The city government offered ISKCON a patch of land for temple construction on Leningradsky Prospect, but two years later tore up the agreement following strong protests from the Russian Orthodox Church. Orthodox hierarchs objected to the large size of the proposed Krishna temple and its location on the site where thousands of Muscovites had been trampled to death during the coronation of Tsar Nicholas II in 1896. ISKCON was offered another plot of land on the sparsely populated outskirts of Moscow, but that was again taken away earlier this year just as the Krishna community was about to launch the construction. “We spent about 70 million roubles ($2.5 million) donated by our followers on preparing the project, but the Moscow government withdrew its permission just as we completed the long-winding project clearance procedure,” said Sergei Andreyev, who is in charge of the temple construction at Moscow ISKCON. In their terse written response to questions from The Hindu, the Moscow Mayor’s Office cited “mass protests by residents” as a reason for cancelling the allocation of land for the Krishna temple. This argument raised eyebrows at ISKCON. “The nearest apartment houses are about one kilometre away from where our temple was to be built,” said Mr. Andreyev. Yet, protests did take place a year ago when hundreds of Orthodox Christians and Muslims picketed the site of the would-be Krishna temple to protest the foundation stone laying ceremony. The Moscow government is now promising to find another site for an ISKCON temple, but is yet to come up with a concrete offer. Meanwhile, the threat of eviction is still hanging over the temporary Krishna temple on Leningradsky Prospect. 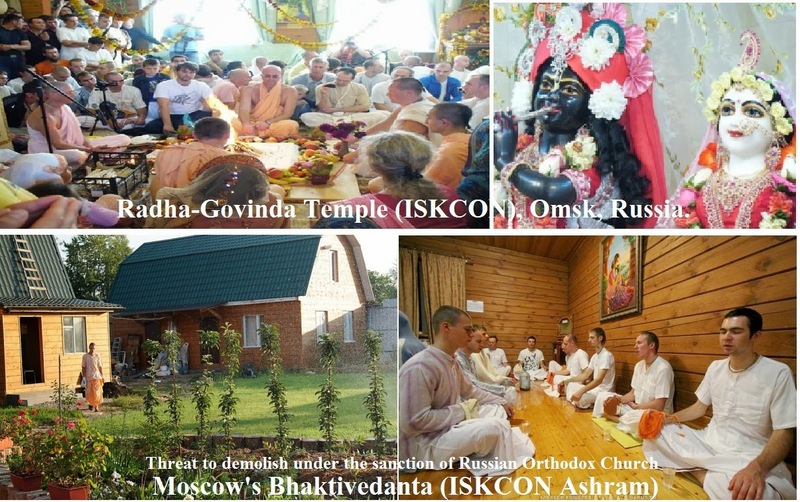 ISKCON devotees argue that the Krishna temple in Moscow has not only religious, but also cultural value for Hindus living in the Russian capital. The ISKCON temple woes come two years after state prosecutors tried to ban a Russian translation of the Bhagavad-Gita As It Is, accusing the Krishnaites’ sacred book of inspiring “religious hatred” and being “extremist in nature.” After months of hearings, a court in the Siberian city of Tomsk threw out the case, but the trial left a bad aftertaste in the Krishna community. “It is difficult to say whether there is some persecution or somebody is against Hinduism in Russia, but if you think logically, you come to the conclusion that there may be some ideological reason behind it,” Priya Das said. Although the Hare Krishna movement was legalised in Russia in 1988 it is still looked upon with suspicion and hostility by many Russians. Many priests and theologians of the Russian Orthodox Church, such as leading anti-sect activist Alexander Dvorkin, who heads the Expert Council for Religious Studies at the Russian Ministry of Justice, have branded the Hare Krishna movement as a “totalitarian sect” that has nothing to do with mainstream Hinduism. Critics accuse Russian Krishnaites of pursing an aggressive campaign to recruit new worshippers among followers of Russia’s “traditional” religions — the Russian Orthodox Church, Islam, Buddhism and Judaism. They say the scale of ISKCON activity in Russia is incomparable with the size of the Indian diaspora estimated at about 15,000 people, including several thousand students. ISKCON operates 120 centres across Russia, runs schools for children, publishes dozens of book titles in Russian and distributes free food to the poor and victims of natural disasters. Christian and Muslim activists have repeatedly protested against ratha yatra rituals, held by ISKCON across Russia every year “under the guise” of a festival of Indian culture. The priest compared Hare Krishna to Aum Shinrikyo, a Japanese doomsday cult.